Who ever heard of a free campground that even provides free electrical hookups? It’s a rarity for sure! 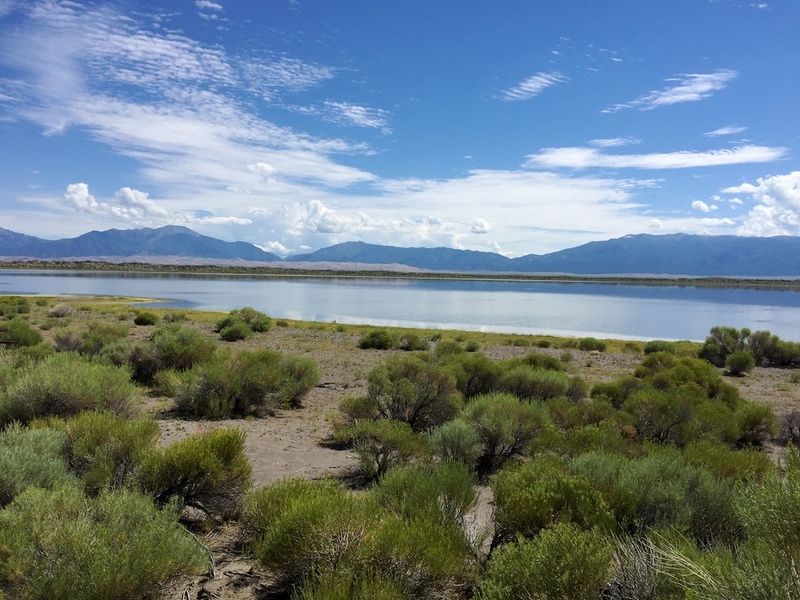 Now let’s add a few other things… Nice campground with good facilities, short drive to the Great Sand Dunes, view of the lake with the mountains rising behind it, plenty of space and privacy, quiet nights, and good cell service. All that, and it’s free? San Luis State Wildlife Area is located just a bit southwest of Great Sand Dunes National Park, in southeastern Colorado. San Luis Lake is the centerpiece of the park, and the campground is on the west side of the lake. 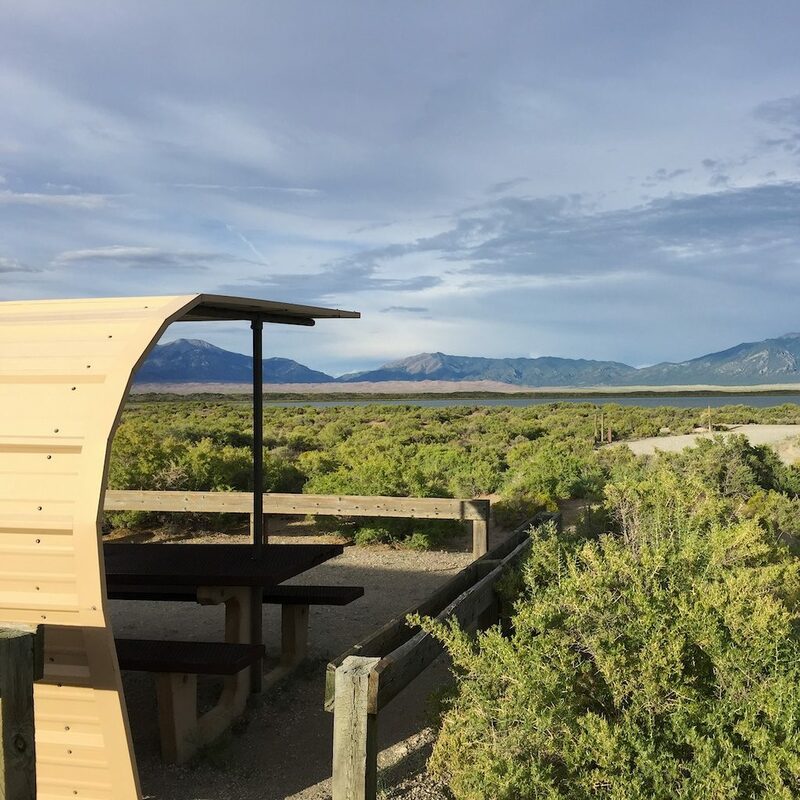 As you face east towards the Sangre de Cristo mountains, you’ll be looking across the lake, and will see the sand dunes at the base of the mountains. 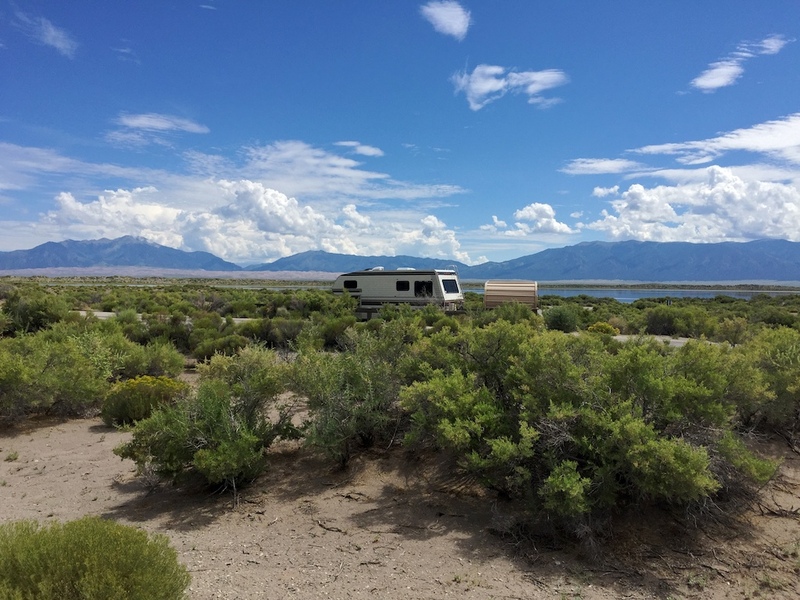 It’s a beautiful view, and one that many of the sites in this campground can enjoy right from their campsite. This looks like a fairly modern campground, that was thoughtfully planned and built to last. Most of the campsites have pull throughs, and are suitable for any size vehicle. All sites have a picnic table with a shade/wind structure, which seemed to be perfectly positioned for the conditions while I was there. You also have a fire ring, grill, and free electrical plug-in! The campground has vault toilets in two of the loops. The other loop has no open bathroom facilities, so you’ll need to be self contained. There’s a dump station (with no water), and garbage collection (though that may not be permanent). Water is available just across the way at the national park. What is it missing? Water! There’s no water, so come well stocked in that regard, and you’ll find everything else here. There’s even good cell service here, at least on T-Mobile! Why is this campground free, when it’s obvious that considerable time and money went into creating it? And why the free electricity? San Luis Lake used to be a Colorado State Park, and this was a State Park campground. Then there was a problem with their water quality. 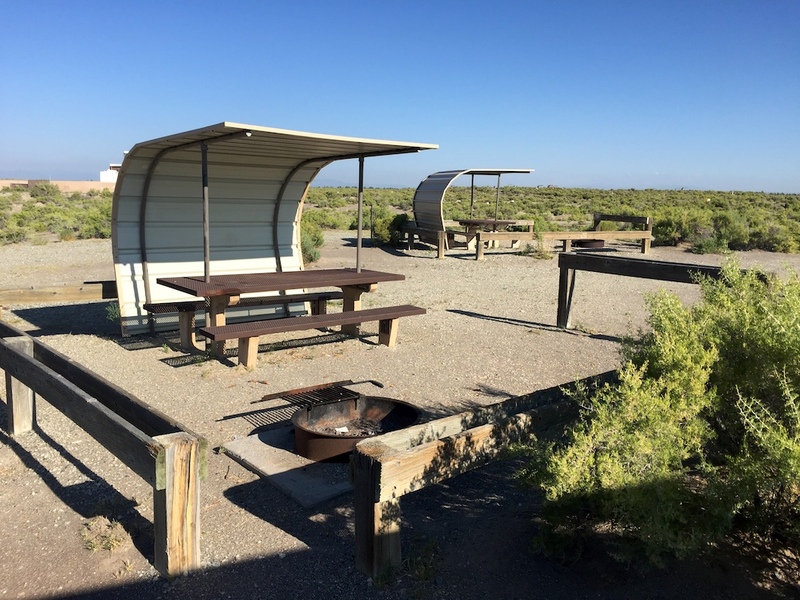 It would be too expensive to upgrade the water system to meet the required standards, so instead of doing that, they changed the State Park to a State Wildlife Area, and made the campground free. As for the electrical, the lake has hydro power right there, so I guess since everything was already wired for power, the easiest thing to do was leave it as is. When they made the change, this campground was going to be completely primitive, with no bathrooms, no garbage, no services at all. That’s understandable — since it’s now free, they have no revenue to offset the cost of those services. But the camp host I met in 2017 convinced them that they really need to open some of the bathrooms and provide garbage service, or things would deteriorate. She convinced them for now, but I don’t know how long this will last. On a funny note, I discovered that one of the strangers I’d been following on Instagram was camped here at the same time! It’s really fun to meet an Insta friend in person. I’ll now be following @setemupjo with a different viewpoint, knowing the real person behind those alluring travel pix! 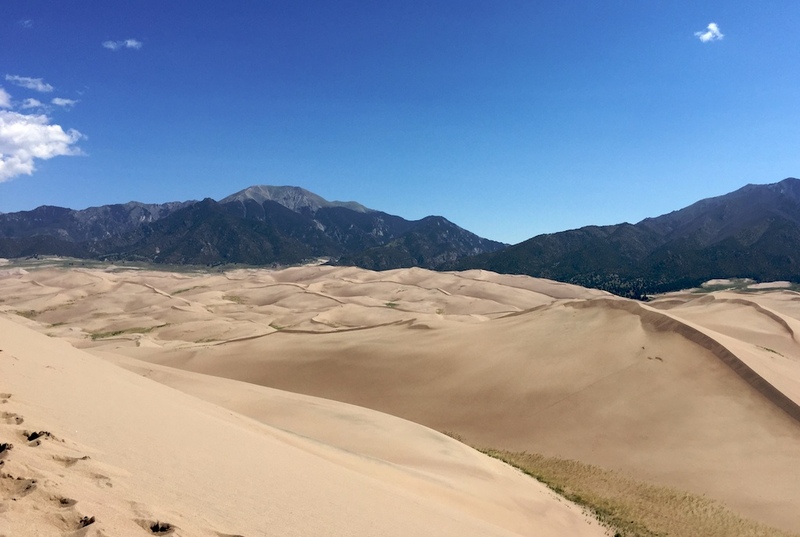 Great Sand Dunes National Park is a must see when you’re in this area. It’s really a cool place, and you could easily spend a few days here exploring different areas in the park, if you’ve got the time. The dunes look so incongruous, when you see them standing at the base of the Sangre de Cristo mountains. It’s a remarkable contrast between the pale sand dunes, with their gently rounded curves, and the dark craggy peaks, jutting harshly skyward. These are the tallest sand dunes in North America, and in spite of their soft appearance, the continually shifting sands create a challenging environment for the local flora and fauna. It’s a challenging environment for hiking, too! Hiking up a dune sometimes seems like 2 steps forward, 1 step back, but the views as you climb are incredible. “High Dune” is about 700 feet high, and gives a superb view out over the other dunes. Many people want to try sandboarding and sledding down the dunes. The park service recommends using boards and sleds that are purposely designed for sand, not snowboards, sheets of cardboard, or other things. You can rent these at a shop just outside the park. One thing to note is that the area near High Dune is very popular, and you’re apt to see a lot of other people clambering and sliding on the dunes around here. If you’re looking for solitude, you’ll have to explore further afield. It made me want to go back sometime, and get lost in those shifting sands… Well, not literally lost! 😉 Just away from the crowds, to a place with no footprints. I’d love to backpack into the middle of the dunes. The thought of camping out deep in the dune field, with nobody else around, seems so exotic! That’s on my list for some future time! View from the High Dune. I’d love to camp out in the middle of that! 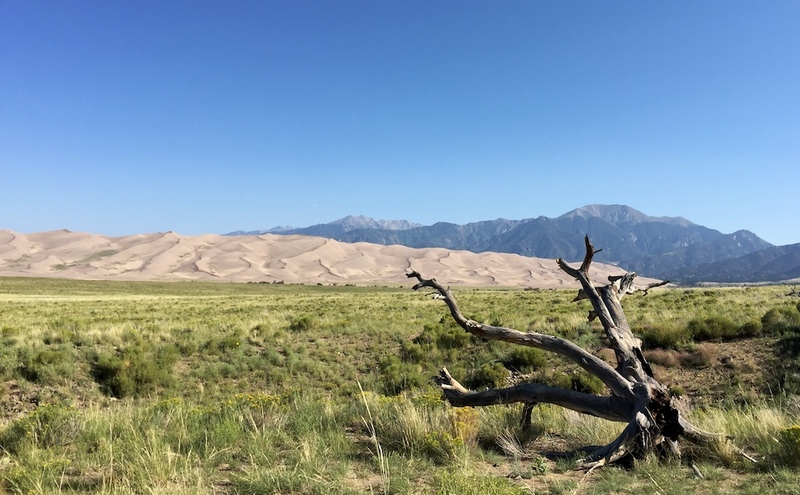 There are hiking options in Great Sand Dunes National Park, but from here you’re also very close to the Sangre de Cristo Wilderness. 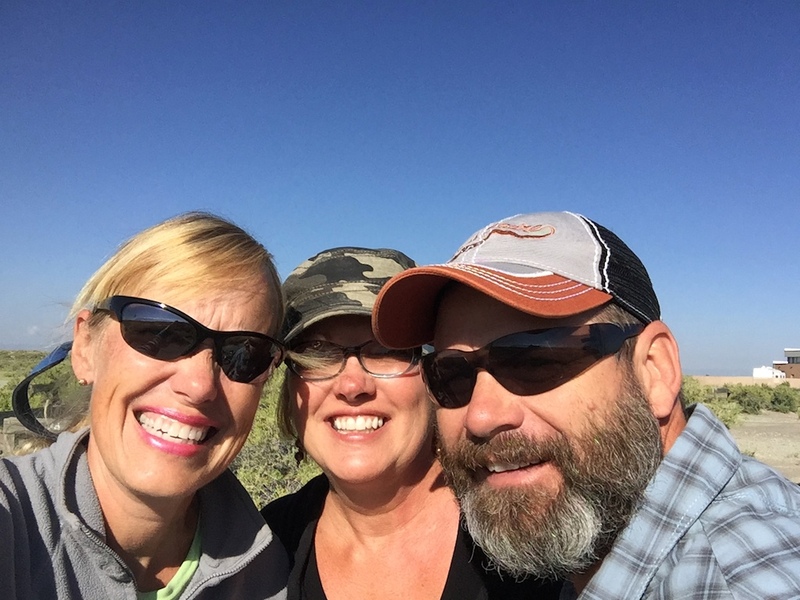 If you want to hike there, explore an old ghost town, or attempt one of the local 14,000+ feet peaks, there’s free camping at Lake Como Road that gives you a good base camp for doing that. 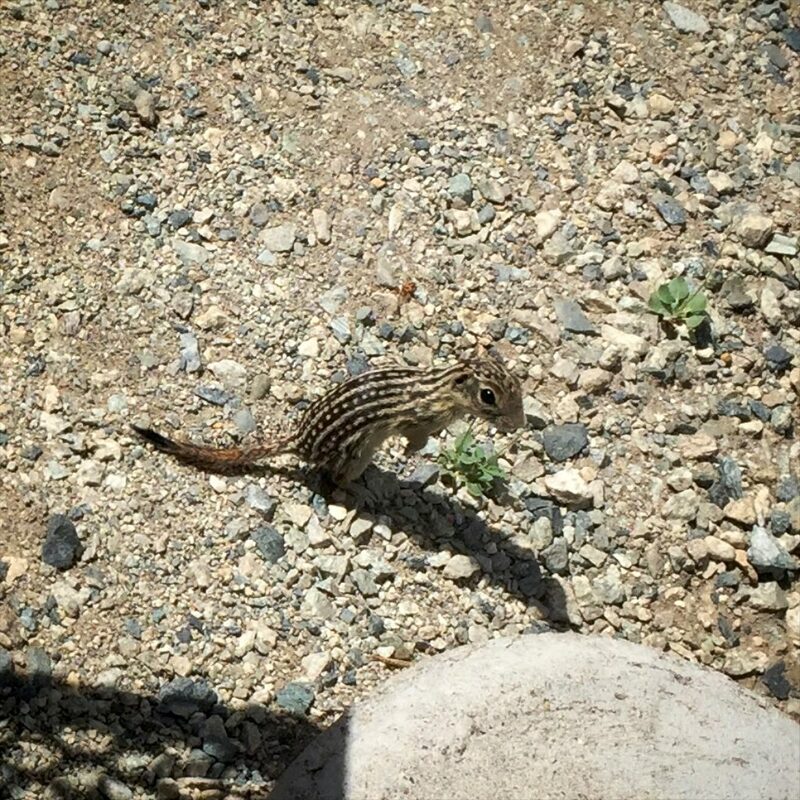 The nearby town of Hooper is where you’ll find Sand Dunes Recreation. This is a campground and RV park, and they also have day use for their swimming pool and hot springs. One great idea they have there is the Greenhouse, an adult-only hot springs area. This has a large swimming pool, three different temperature soaking tubs, a sauna, and patio seating areas. There’s also a bar where you can buy a drink to enjoy as you soak and socialize. It seems ideal, and I’m surprised more places haven’t tried this! Get here while it lasts! Frankly, this campground seems too good to be true, and too good to be free! Zennie parked at a campsite. It’s not exactly crowded here! I’m afraid that one of these days, the powers that be will decide to close it down altogether, since it is a net drain for them money-wise. Or who knows? Maybe some day they’ll fix the water problems, and it will go back to being a typically priced state park campground. Official campground. Well designed campground near Great Sand Dunes. Easy access, most sites have pull-throughs. Picnic tables, shade structures, fire rings. 2 of 3 loops have vault toilets, other has no bathroom. Free campground includes free electricity. No water.